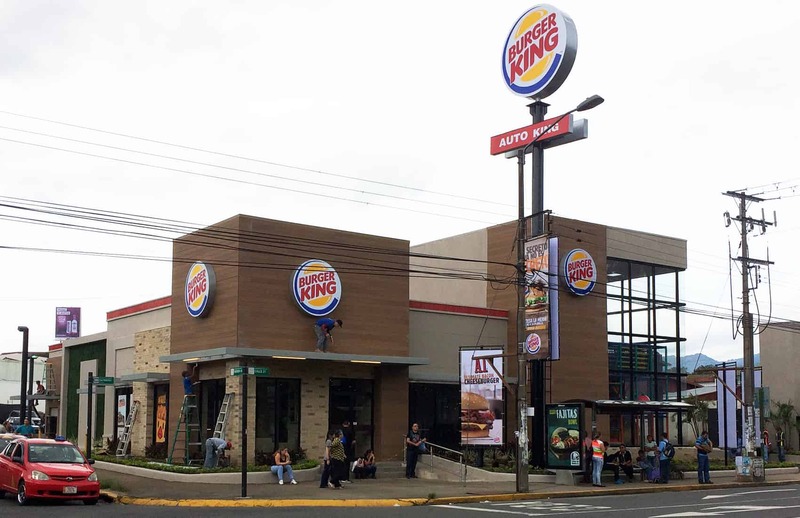 Burger King is back in Costa Rica just eight months after the former franchisee closed its operations here due to financial woes. The first restaurant of the U.S. fast food chain opened Wednesday in front of Parque de la Paz, south of downtown San José. Salvadoran business group JV de Centroamérica S.A., the new owner of the franchise, has announced plans to open 10 more restaurants in the coming months. The group will operate in Costa Rica under the corporation Alimentos Exclusivos BK Costa Rica. The company confirmed two more restaurants will open in the next two weeks in Guadalupe and Tibás, north of the capital. JV de Centroamérica S.A. also operates Juan Valdez coffee shops here and the Burger King franchise in El Salvador. In a news release, the company said it had hired 85 employees and expected to end the year with some 100 employees. Some 70 percent of those employees had previously worked at BK restaurants, the company reported. The parent company said in a press release at the time that BK Costa Rica was operating the brand illegally since its contract had expired in September 2014. The corporation also said it looked forward to returning to Costa Rica soon. Besides failing to pay franchise rights, the first BK Costa Rica’s closure followed problems with liquidity and accumulated debt, including more than ₡300 million (some $550,000) owed in taxes and social security payments. The Foreign Trade Ministry tried unsuccessfully at the time to mediate between the parent company and BK Costa Rica to prevent the closure. After the franchise’s exit, other fast food companies, including McDonald’s and KFC, bought several of the Burger King locations. BK Costa Rica wasn’t the only fast food franchise to close shop last year: In January, Wendy’s closed its local operations and dismissed 110 employees. In a news release posted at the time on its Facebook page, the company blamed the excess of fast food restaurants in the country, which spiked dramatically in the last five years. “Currently, Costa Rica is the third country in the world with more restaurants per square kilometer,” the company said at the time. Wendy’s had been in Costa Rica for eight years. The return of Burger King indicates a recovery of the fast food market following a spate of closures. Besides Wendy’s, Domino’s Pizza and Bagelmen’s also exited Costa Rica in recent years. According to daily La Nación, KFC plans to open three to five restaurants a year over the next five years. McDonald’s opened two new locations this year, in Heredia and Cartago provinces, bringing its presence in the country to more than 100 locations. QSR International group, which operates 28 fast food restaurants here, announced plans to open three new locations of Quiznos and one of Teriyaki Experience in the next two months. The company also manages the local franchise of SmashBurger. According to data from the National Franchise Center (CENAF), part of the Costa Rican Chamber of Commerce, there were 217 international franchises here at the end of 2015, representing 78 percent of all franchises in the country. A quarter of those foreign franchises are in the food sector. There are 61 Tico franchises in Costa Rica, almost 60 percent of them in the food sector.